The Wild Inside: It began with a bead .. It began with a bead ..
.. in the spring of 2009. The bead belonged to my potter friend, Mary Ann Evans. I had been showing off a bracelet I'd made which contained an old African trade bead, and she pulled out this large, colorful bead to show to me. It's about an inch and a half long and a half inch wide and appears to be a glass millefiori trade bead. Beads similar to this can be traced to ancient Rome, Phoenicia and Alexandria. Archaeological sites in Ireland uncovered canes dating to the 8th century that were probably made in Venice. Prior to the 15th century, glass makers were only producing beads from Rosetta canes. Like Chevrons, Rosetta beads were made by adding a number of layers of colored glass in a mold and then pulling it from either end into a long cane. The cane was then cut into short segments. She handed the bead to me and said "See what you can do with it." So .. I took it. And it sat inside a little zip lock bag on an area of my work bench where I could see it pretty much any time I was working. She had suggested "a pendant or something" .. but it kept whispering bracelet to me. Things were pretty crazy between June and November last year; but I think an idea began percolating almost immediately. Since the bead was so large, the piece had to be on an equal scale. 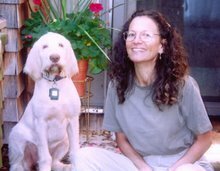 But I didn't want it to be big and bulky, since the few things of mine Mary Ann owns are rather delicate. However, after discovering her wrist size was a nice average 6.5", I felt she could carry off what I had in mind. What I ended up doing was making it entirely out of fine silver links .. in a gauge heavy enough to allow for some attractive hammering and forging without the weight. The five links attached to the hook mimic the design splotches on the bead, and the mother of pearl and blue sponge coral beads pick up a couple of the dominant colors. Despite the heft of the trade bead, the bracelet is very light weight. 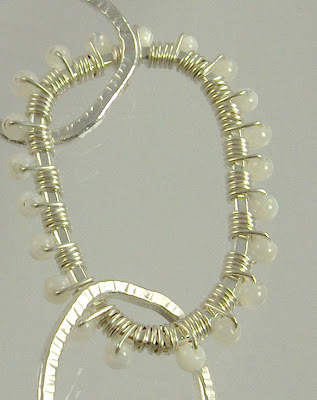 The larger of the links contains wrapped 2.5mm mother of pearl beads on fine silver wire. I've already given Mary Ann the bracelet or I would have taken another shot of this link .. there's actually a front and a back to the bead, and this, much to my dismay, is the back. The wire extending up to the bead isn't as prominent in the front. It still looks good, but I'm sorry I didn't notice that when I was taking the photos. As I've mentioned in previous posts about pieces containing fine silver, one can "harden" fine silver by giving it a good going over with a hammer. This changes the composition of the metal's crystals in such a way that a very malleable piece of wire becomes very rigid. It would be difficult to bend several of these links without a bit of effort. Because fine silver IS so soft, however, it's easy after flattening and hardening a link to add a little surface design interest with whatever might be at hand .. in this case, the smaller ends of several different types of hammers in my arsenal. It's a funky piece, to be sure; and I like it enough to maybe try a similar design with a slightly different focal bead. I have a whole lot of them from which to choose, so we'll see what kind of interesting pieces I can get out of this idea. This particular piece I called Manic Millefiori. Might be time to purchase some more fine silver wire! I love the jewelry I would like to learn how to make jewelry! You have a real eye for that sort of thing!